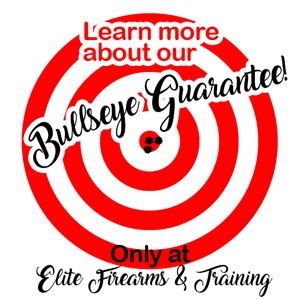 How many instructors can guarantee that they’ll train you until you shoot a bullseye? Well, Elite Firearms & Training will! This private lesson includes an hour or more on the range, unlimited answers to your questions, tips and techniques that will improve your shooting skills, and guarantee to feel more confident in your accuracy. The lesson doesn’t end until you shoot a bullseye!